The Nike Kobe X. Can’t believe it has been ten years since Kobe Bryant’s first signature shoe and his line has come along pretty well. Being the man behind the original Hyperdunk, the man responsible for the low-top era that started with the Kobe 4, Mamba and Eric Avar have been nothing short of legendary. As I am every year, I get stoked seeing a Kobe model for the first time. Regardless of how I felt about it moments before, seeing it on hand is always special. With the Kobe X, it was no different. The shoe felt lightweight and immediately I removed the paper to see what kind of insole was in it. For the past couple years, Nike has provided a Lunarlon drop-in midsole, or insert, or insole, whatever you wish to call it. This time around, Nike has sailed away their Lunarlon ship and now provides a somewhat thick ortholite insole as seen here. The forefront of the insole has criss-cross lines on it assuming it would help prevents the foot from sliding within the shoe. Anyways, as I put the shoe on, I noticed that the tongue was a lot thicker than most. I really dig this as lace pressure would not be an issue. The padding is also adequate enough to keep foot locked in. They run true to size. I went with my regular size 9 and it seemed fine. No problem here. Now two things I took from my initial try-on. First is that the shoe felt solid. My concern was the midsole and how the heel would be a little too high off the ground considering it looked very similar to the Nike KD V Elite a few years back. That shoe was absolutely terrible. From the early pictures, the outsole looked exactly the same, but these Kobe X’s are nothing like the KD V Elite. The outsole forms a lot better to the foot I blame the base frame of the sneaker. The midsole is solid and not as firm as I thought it would be. It’s hard to explain how the outsole and midsole feel like, but it’s new to me. I’ve never seen any shoe like it. It’s not a hard rubber or foam, it’s something else. Second thing I noticed about the Kobe X was the Fuse upper. 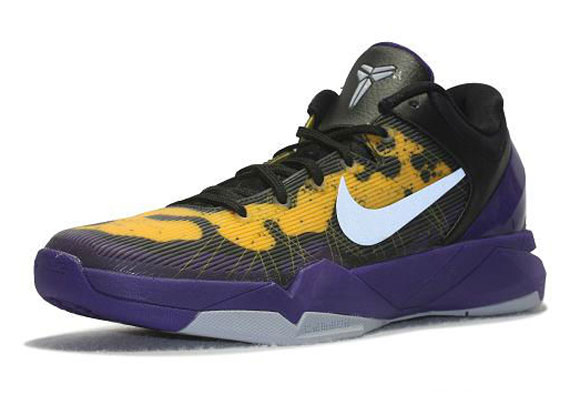 I don’t mind HyperFuse at all, but for a signature shoe for Kobe Bryant? I expect more than just typical Fuse. The Fuse feels a lot like any other fuse seen on the Kyrie 1 and it feels it would take some break-in time. I didn’t feel any hot spots at all. Usually, shoes with a full-on HyperFuse upper like this, there would be a slight crease and “digging” into your foot as you bend and flex around. Think about the KD VI, as it dug into the top of your foot as you took a step. Thankfully, I experienced no discomfort at all. Now I know most of you loved the Nike Lunarlon set up, but Nike Zoom will always be my favorite. Kobe Bryant had Zoom Air as his main cushion since the early Nike 2K4 Huarache days to the Nike Zoom Kobe 4, 5, 6, and 7. Despite Nike getting rid of the Lunar insert, the cushion is still pretty damn good. Kobe used Nike Zoom in his first. I believe the forefoot contains Lunarlon which was soft and low-profile. In the heel however, Nike debuts a Zoom Max system for the Kobe series. Now the Zoom max is actually inside the heel rather than bubble. It’s quite difficult to explain, but take a look at the comparison that I made between the KD 7 and the Kobe 10. You can feel the bounce, but the carrier is solid and firm that it doesn’t feel unstable. Do remember that this is just an initial wear. I have not hooped in them or ran around actively. Here is a side-by-side comparison of the Zoom Max tooling between the KD VII and KB X. The compound of the rubber is nothing like the Kobe 9 which had exceptional traction. Grippy. Squeaky. It’s weird though as the outsole feels gel-like. I pressed down on it and it compressed like if it was a gel-insole. Again, something I am not used to, but it feels great. 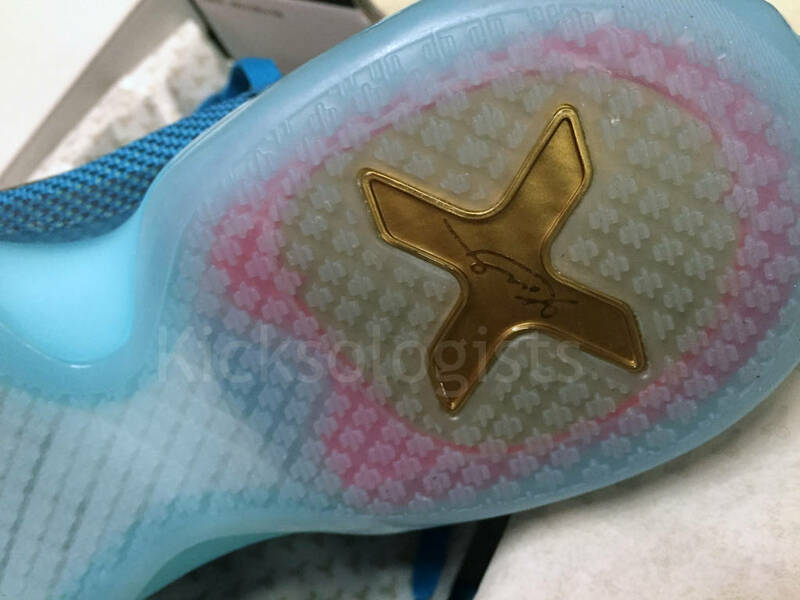 The Kobe X outsole has a unique pattern and design, but it works. I wasn’t on court or anything, but the floor was squeaky and it seemed to grip pretty well. I can’t really say much here, but i’m not too worried about traction for the Kobe X. Support is arguably the most important category when you’re hooping as you don’t want to end up injured. Lockdown felt great. The heel counter felt nice and solid. Out of all the Kobe’s, I still put the Kobe 5 as the top heel counter of the series. It cups your heel in so perfectly. I think of it as a carseat for a child. You buckle up (lace up), and keep that baby within the seat keeping movement within the footbed at a minimum. The tongue is the same as the Kobe 9 Elite seen in the photo. The collar padding is nice as well. Lastly, the lacing system is simple. Kept my foot in place and had no trouble. That’s pretty much it for my first impression. From my personal standpoint, the $180.00 USD price tag doesn’t justify the product. Getting rid of the Engineered Mesh and in turn replacing it with Hyperfuse doesn’t explain the $20 increase. Neither does the cushioning system. I understand Nike’s price increase the last couple years, but paying $180 for the low-top version of a sneaker that was $125 back in 2008-2009, I don’t know man. That’s almost as much as the remastered Retro Jordans. The Nike Kobe X should be $160… or even $170. But $180? Ha… then again, I will still be purchasing it. There will also be a Hightop Kobe X as well, but no price point has been confirmed for those. I assume it would be $245. Again, a $20 difference. I hope this long impression gave you some insight on the next Kobe sneaker. If all goes planned, this will be Kobe Bryant’s last sneaker for his final season in the NBA. Unless Nike makes another, Kobe XI, this will be it for you Laker/Mamba fans. Nike Basketball has not yet announced the official unveiling for the Kobe X, however it will most likely be held in LA in the next couple weeks. Keep it locked here for the latest updates and news on the Kobe X. The Nike Kobe X “Blue Lagoon” will release on February 7, 2015 for $180.00 USD as a general release at select Nike retailers. Thanks for this. Wanted to clarify to everyone-the four stitches on the left shoe represent the Achilles surgery on Kobe’s left achilles. It’s a symbolic touch to the shoe. I truly don’t get it, this shoe’s tech is comparable to the $100-120 Nike’s, and the look is so basic, that most people won’t even realize it’s a signature shoe, it’s such a non-statement for a 10th anniversary shoe. gdi…u da man! i like the blue lagoon..fav is the purple. not happy if the black is the rumored asg. major let down. i love the kyrie1 and if the kbX upper is same material as the kyrie we are in for a great shoe! i for 1 usually go up .5 thou!